Success stories/projects we want to feature on the overall Success stories page. Lynker earned a NOAA’s Small Business Success Story of the Year in 2015. Lynker provides systems engineering, data management, GIS software development, and quality assurance support which has helped improve the accuracy, speed of processing, and distribution of critical nautical chart products to federal and commercial stakeholders. 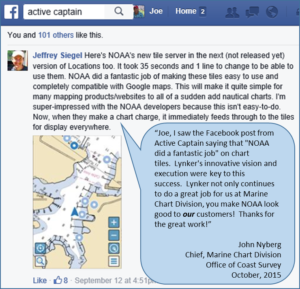 Our team built and supports NCSII (Nautical Charting System II), which is used by over 50 GIS Cartographers in OCS. The NCSII system maintains a vector nautical database which used to produce Electronic Navigational Charts (ENCs).